Have you seen chimneys that seem to be crumbling, or have bricks missing? Often this type of deterioration is caused by water: Water soaks into the chimney every time it rains, and during the cold winter months, the chimney is subjected to regular freeze-thaw cycles. Since water expands when it freezes, these freeze-thaw cycles gradually break apart the mortar between the bricks – and in some cases, the bricks themselves. Eventually, the chimney has to be rebuilt, at great expense. Complicating the problem is the need for moisture inside the chimney to get out. If you seal the surface of the chimney, then water vapor present in the exhaust from your stove or fireplace will be trapped in the chimney, and the same kind of freeze-thaw damage will occur. But there is a solution: We can treat your chimney with a specially-formulated chimney water repellent that sheds water when it rains, but allows water vapor inside the chimney to escape. 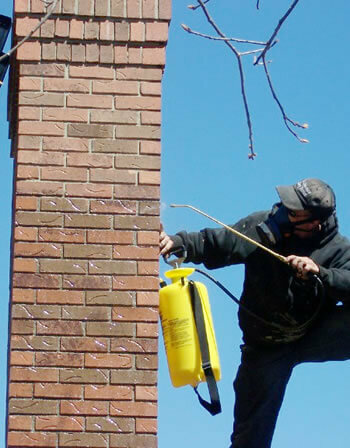 The photos below demonstrate how chimney waterproofing is applied to a brick chimney by a chimney professional from Four Seasons Chimney Service. The product that we use is available only to chimney professionals since its application requires special training; the product is not available to homeowners other than through a chimney professional. The water repellent we use will not change the patina and will not add a gloss or shine to your brickwork. Waterproofing a chimney is one of several steps we can take to prevent water from entering your home. Another is the use of a chimney cap as seen in the second photo below. 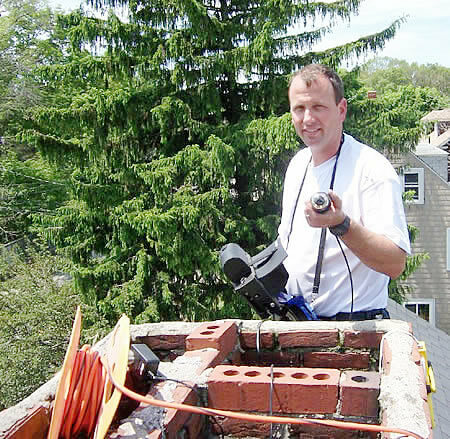 Protect your chimney from long-term water damage. 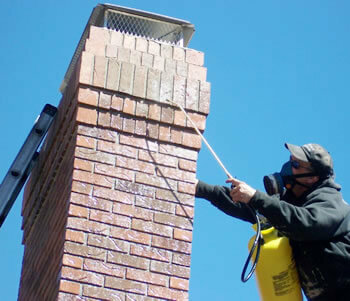 Call us for details on a chimney water repellent treatment.